This collection of chemical and molecular structures has been designed to accompany the upcoming edition of Biotechnology: Science for the New Millennium, by Ellyn Daugherty. All the types of structures below can be viewed in Molecule World on the iPad or Molecule World for iPhone. 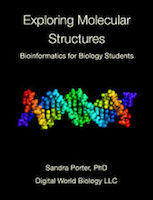 More information about the textbook and related materials can be found at BiotechEd.com. To view the collection, you will need to download and install the iPad version of Molecule World. Once Molecule World is installed on your iPad, return to this page and download the entire collection at once by selecting the mwc file. Maltohexaose is an intermediate in the production of maltose from starch by alpha amylase. A disaccharide with two glucose subunits and the same kind of bond found in cellulose. Normal alpha amylase, aligned to a heat tolerant version of the same protein. Heat tolerant alpha amylase, aligned to a normal version of the same protein. A heat tolerant form of alpha amylase, engineered from Bacillus lichenformis and Bacillus amyloliquifaciens. A wild-type form of alpha amylase from Bacillus licheniformis. Alpha amylase with maltose from Bacillus sp.707. Maltose is produced when alpha amylase digests starch. Select the first five glucose monomers (GLC) to highlight maltose. A beta amylase from Bacillus cereus. This enzyme works best at pH 6.5. RNA polymerase from E. coli, in a transcription initiation complex. IPTG, used for inducing genes controlled by the lac promoter. A short chain of double-stranded DNA. Hydrogens are not shown because this structure was obtained through X-ray diffraction.